Man-Booker prizewinning author Marlon James in a freewheeling game of verbal ping-pong on African mythology, '80's hip hop, heavy metal, tattoos, and billionaire philanthropy. "Black Leopard, Red Wolf" has been compared to "Lord of the Rings" and "Game of Thrones", but it's something entirely different. Growing up gay in a deeply religious Jamaica and writing his way out of there. Trickster narrators, truths you have to sort out for yourself. Marlon James with host Jason Gots after the taping. At this point, it's very rare to read something and find myself thinking: This is something new. This is unlike anything I've ever read before. It doesn't have to be written in hieroglyphs or be some kind of three-dimensional interactive reading experience with pull-out tabs and half the pages upside down. That kind of formal experimentation, in my experience as a reader, more often ends up being gimmicky and annoying than exhilarating. In fact, paradoxically, the "wow this is something new" experience often comes along with a sense that this new thing has somehow always existed, in your dreams if nowhere else. 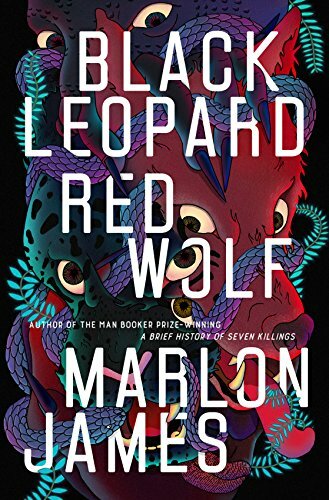 Marlon James—the Jamaican writer who won the Man Booker Prize for A Brief History of Seven Killings— has done something in his new fantasy novel Black Leopard, Red Wolf that's unlike anything I've ever read before. The first book of a trilogy, it's been described as an "African Game of Thrones" and likened in scope to Tolkien's Lord of The Rings. But the stories within stories it tells and the shifts in voice and perspective thrust you into a seething, hallucinatory, morally ambiguous world that's part Ayahuasca dream and part blacklight nightmare, anchored in a rich African mythology that's worlds away from all those elves, wizards, dragons, and goblins—all those well-worn tales of light versus darkness.